Bhubaneswar: Continuing its stance of “Zero Tolerance Policy’’ towards encroachment of road, drain and illegal occupation of Government land the joint enforcement squad of Bhubaneswar Development Authority (BDA) and Bhubaneswar Municipal Corporation (BMC) and Commissionerate Police today removed the unauthorised occupation of Government land near Santoshi Maa temple at Bomikhal near the main road. The eviction programme under the Central Enforcement Monitoring Committee (CEMC) was organised following a requisition given by the Public Works Department (PWD) for expansion of road and construction of drain. The Santoshi Maa Temple was in possession of roadside Government land at the vital location. The PWD requisition was made on August 13, this month. The portion of the Santoshi Maa Temple (front portion) identified by the officials of PWD for development of road and drain and tin sheeted -extension of eight shops were removed. One excavator and one chain-mounted Poclain machine of PWD were engaged during the eviction drive. ACP Amarendra Panda, Inspector-in-charge, Laxmi Sagar PS Dayanidhi Nayak, PWD Assistant Engineer Dilip Kumar Sahoo, BDA Enforcement Officer-II Pramod Kumar Patro and Liaison Officer Subhransu Sekhar Mohanty were present among others. One platoon of gents APR force and one section of lady police force were present at the demolition site to maintain law and order during the demolition drive. Two enforcement squads of BDA were also deployed. 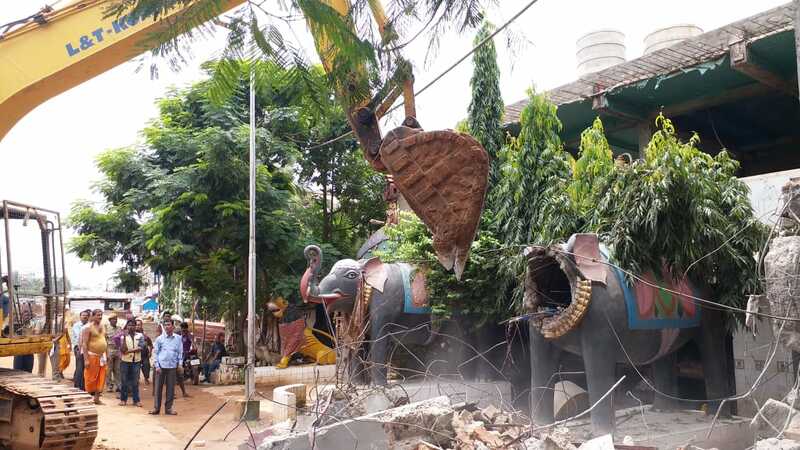 In another eviction drive demolition was carried out by BDA and BMC joint squad without police personnel near Kalinga Hospital Square, where illegal extensions of Prayas kiosks were rampant. After yesterday’s demolition of five unauthorised extensions, balance 15 structures were demolished today.